STUDENTS OF THE MONTH. The student of the months for September was Nicholas Bellingham, for October was Jake Hebert and for November was Sammy Crochet. All three are brown belts and all three participated and did very well at the Youth Tournament last weekend in Ponchatoula. I will post a complete recap of that event soon. Congratulations to all three students for their recognition and thanks for the great work ethic each student has shown. DAN RESULTS / 2008 CAMP. Last weekend, NIKI co-hosted our annual Lafayette Training Camp and we made a very strong showing at a very vigorous camp. Candis Durand and Chad Norris were among the participants and each had an outstanding camp. Both Candis and Chad tested for and were promoted to Nidan (2nd Dan). They also both participated in the team trials for the All South National teams and Candis made both the women's Kumite and Kata team and Chad was named an alternate for the men's Kumite team. Congratulations to both. Here are some shots of them in action at the team trials. More photos can be found by clicking here. Thanks to Brayon's mom, Shantell, for taking many of these pictures. Candis and Chad will participate individually as well at the JKA nationals in Tamp a on October 11, 2008 along with NIKI’s other youth competitors Cody Sedlitsky and Chase Norris. This tournament serves as a team trial for the national team selection for the Funakoshi Cup held every three years in Tokyo (September, 2009). Lane Nevils (men’s Kumite / kata teams), Soon Yeoh (men’s Kumite / kata teams), and Holly Damico (women’s kumite team) from the Lafayette Karate Club (LKC) will also be participating in the tournament. I wish all the best of luck to our local competitors. Let’s all strive to challenge them in the next couple months so that they will give their strongest performances. TEST RESULTS. I thought everyone did well and showed great spirit on the test. 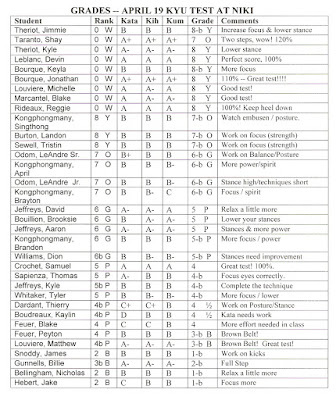 Please see your results below and the belts and certificates will be awarded next class. Summer 2008. I am sorry that I have been unable to post more this summer. We had as our June Student of the Month Thierry Dardant. Our July Student of the Month was Kyle Jeffreys and our August Student of the month is his dad, David Jeffreys. Congratulations to all on a job well done. It is hard to train consistently during the summer and I appreciate everyone's efforts. Our summer camp begins today, Friday August 8, 2008 at Heymann Park Gym, 1500 S. Orange Street, Lafayette, LA. You can find more details on it here. 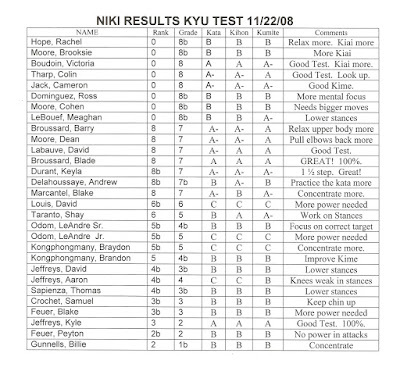 Our kyu test is Sunday, August 10 at 11:15 a.m. at Heymann Park Gym, 1500 S. Orange Street, Lafayette, LA. 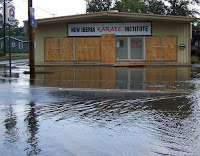 I will try to promptly post the results of the exam on the web site for you and at the dojo. ALL SOUTH SUMMER CAMP 2008. 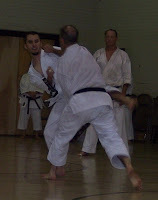 The 36th annual All South Karate Camp in Hammond Louisiana will be held Friday May 30, 2008 through Sunday June 1, 2008. You can find the camp brochure at this link. Special guest instructor will be Taniyama Takuya of the JKA Headquarters in Tokyo. Please make arrangement to attend this very important camp. STUDENT OF THE MONTH. Reed Bellingham is student of the Month for May. 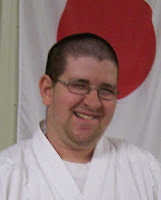 He is our newest Shodan and is a great leader for a young man. Reed, and his whole family (father Steve and brother Nick) actively participate in all the All South events, including camps, clinics, and tournaments -- and it shows. As with any art, Karate is such that the more you put into it the more you will get out of it and Reed is a great example of this maxim. Congratulations Reed on your many Karate accomplishments. NEW SHODANS! Coy Watson, Reed Bellingham and Steve Bellingham all tested for their black belts (Shodan) this weekend in Greenville, Mississippi. All three participated in the weekend training, passed the test and received their Shodan Applications (which are submitted directly to Japan). They all had strong technique and good spirit and were rewarded for their efforts. At the next advanced class, (Tuesday 3/4 @ 7:15 p.m.) we will have the "official" belting ceremony and a couple of other surprises. The common rate of passage of a Shodan exam is around 50%. To have all three candidates from NIKI pass together was a great accomplishment for the school and I appreciate the efforts of these guys and everyone who trains with us and pushes us on to greater goals. With three new black belts we matures significantly and immediately as a club and we can best use this momentum to build the group and club from within. As new black belts, Steve, Coy and Reed are accepting greater responsibility for the promotion and promulgation of our Karate in our club and in our region. Each now has their role or roles to fill, whether it be by example, as Sempai, as teacher, as judge, as student, as athlete or as artist. CONGRATULATIONS, GREAT JOB and BEST OF LUCK with your journey! 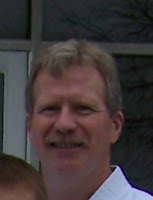 The STUDENT OF THE MONTH for March is Steve Bellingham. Steve is one of our newest black belts (see above). He tested in Greenville, MS this pass weekend and did an outstanding job. Way to go Steve! 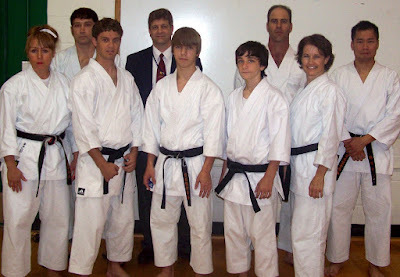 He and his sons, Reed and Nicholas, participate in many of the karate events thoughout the year. They are very enthusiastic and dedicated karateka. Congratulations, Steve, on your karate accomplishments and good luck on your future karate achievements. As a recipient of the March award, he is now eligible for the Student of the Year Award given every December. Keep up the hard work and keep the school spirit high. 2008 ALL SOUTH Karate TOURNAMENT. The 44th annual All South Karate Tournament will be held in New Orleans at the University of New Orleans Health & Physical Education Center on April 5th. Students should begin training especially hard for competition. 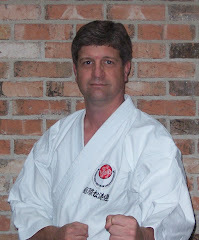 Sensei Scott has kata videos for purchase. The videos follow the Best Karate Series. This is just another tool available for you to perfect your strength and technique. Students are encouraged to participate in the tournaments given throughout the year. It’s a fun way to test your skills against other karate clubs. If you’re not comfortable with participating in the tournament, you may attend as a spectator to get an idea of what a tournament is like and support the karate club. Also, if any adults are interested in running a table at the tournament, please see Sensei Scott for more information. REMINDER. The GASSUKU 2008 is scheduled for MARCH 29th and 30th. 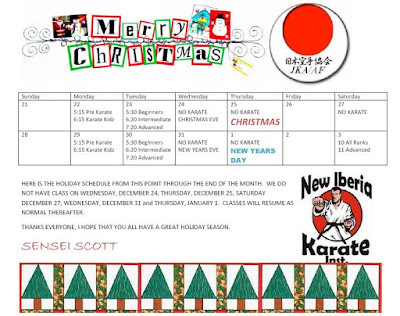 Get your gear ready and check with Sensei Scott for registration forms. JANUARY STUDENT OF THE MONTH -- CANDIS DURAND. The student of the month for January was Candis Durand. 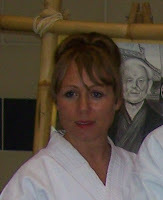 Candis is one of our most dedicated black belts. She participates in numerous karate events throughout the year including this past National Tournament in Phoenix, AZ. Candis is very enthusiastic about karate. 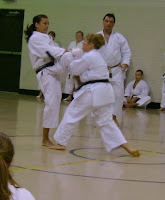 She is training very hard with her focus on testing for Nidan in 2008. She has an outgoing personality which has made her many friends throughout the Southern Region. She is a leader in the dojo and helps to keep the school spirit high. FEBRUARY STUDENT OF THE MONTH -- CODY SEDLITSKY. The student of the month for February is Cody Sedlitsky. 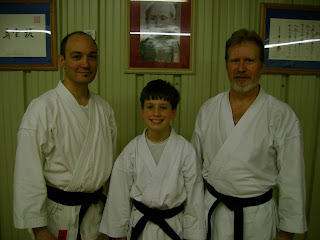 Cody is our youngest black belts. He participates in many karate events throughout the year. His positive attitude, attention to detail and great focus will take him far in karate. Cody is an excellence role model for other young students. Congratulations, Cody, on your karate accomplishments and good luck on your future karate achievements. As recipients of these awards, both are now eligible for the Student of the Year Award given every December. Keep up the hard work and keep the school spirit high. 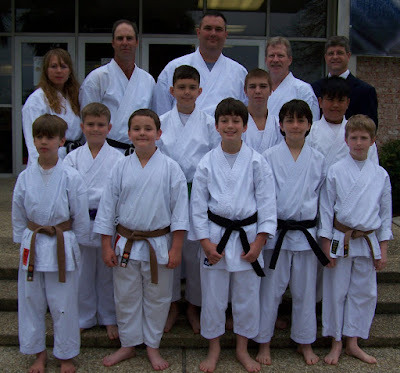 The annual Greenville Karate Camp is scheduled for February 28th, March 1st and 2nd. Students are encouraged to participate in the camps given throughout the year. It’s a way to get extra karate training. Also, it’s a lot of fun meeting new people and spending time with old friends. Keep an eye out for the brochures near the office. We usually stay at the Best Western Regency Inn (662-334-6900). Make sure you mention the karate camp when reserving for special room rates.